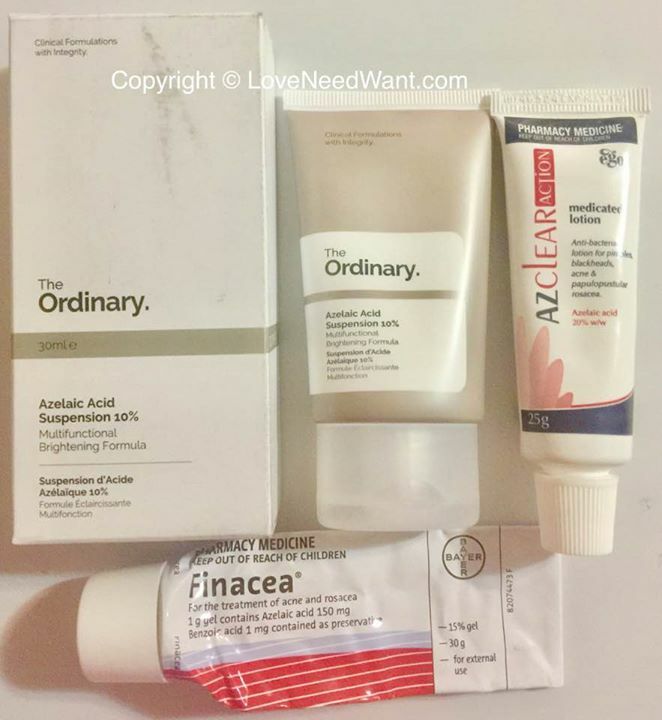 Just bought 11 products of the Ordinary, 6 items arrived. 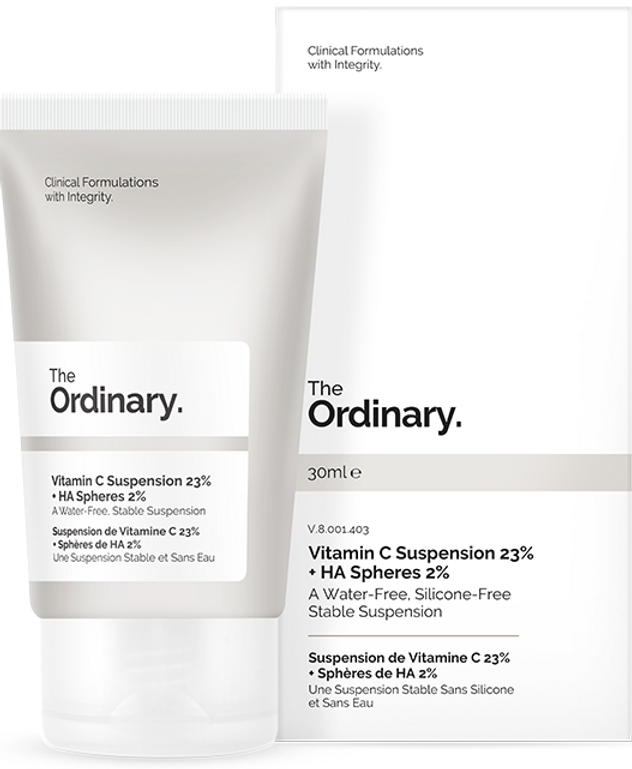 Started with the 1st item, The Ordinary Vitamin C Suspension 23% + HA Spheres 2%. They say it is not suspended in silicones, and there is no water. What are these ingredients? I don't recognise it! So far I love the product, apparently it is suspended in oils. anhydrous formulae. The product works. So far it has made my skin brighter in the first 24 hours, it is supposed to be used last in your routine but I do use moisturisers after it. So far, I have used it 5 days. It is rather incredible how cheap this is! The packaging was so bad!!! The Ordinary have updated the packaging for this, but of course, i got the last of the awful bottles. They now package it in tubes. The serum is thick, like a lotion and the dropper bottle wasn't able to dispense without causing a big mess! I had to decant it. By the way. Other than the packaging, the formula seems to have changed too. Ingredients of the product i received: Ascorbic Acid, C13-15 Alkane, Isodecyl Neopentanoate, Dodecane, Isononyl Isononanoate, Acrylates/Ethylhexyl Acrylate Crosspolymer, Ethylene/Propylene/Styrene Copolymer, Silica Dimethyl Silylate, Ethylhexyl Palmitate, Coco-Caprylate/Caprate, Sodium Hyaluronate, Glucomannan, Butylene/Ethylene/Styrene Copolymer, Bisabolane, Trihydroxystearin, BHT. Only complaint here is BHT. I was going to try the anti-Aging Buffet which you are keen on next... I remember matrixyl has copper in it, which is incompatible with the L Ascorbic acid in the Vitamin C serum I am using. Need to double check. They also mentioned not to use the 10% Niacinamide and Vitamin C 23% at the same time. But do the products remains stable? I've ordered the 23% vitamin c suspension, 5% caffeine+EGCG, the anti aging buffet and the 10% niacinamide. I"ve asked Jetske Ultee, the developer of Uncover Skincare. She said ascorbic acid is too unstable too add to cosmetic products, you can only work with fresh batches. So anything you buy in store or from the internet is oxidized to some extend, en oxidation also causes formation of substances that damage skin. Also did she try to formulate with Green Tea Extract and EGCG, but found that it was too unstable, and when she encapsulated the EGCG it was impossible to add enough to a product. Paulas choice claims to add effective concentrations of all her actives and they remain stable till the end of the POA date. They said they do specific batch testings for that. But to be honest, I believe Jetske Ultee more than Paula's Choice. The Ordinary 23% vitamin c is anhydrous so maybe it's a bit more stable? I would rather have bought the 20% Ascorbyl tetraisopalmitate although that one was not available. 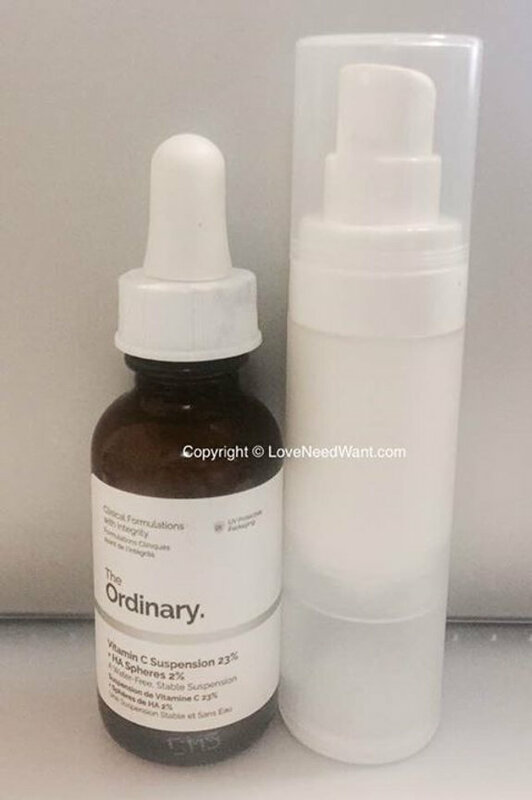 The Ordinary does package retinol in dropper packaging. Which is strange because even Paula's Choice said that you have to use special lighting conditions duringet production of the products, and retinol is so extremely unstable it has to be packaged airless and stored in a dark place. So are the products of The Ordinary really stable then? And besides they are quite simple, ascorbic acid works best for example if it's combined with other antioxidants like vitamin E.
that's why there is 0 water basd Ascorbic Acid serums on the shelves in Australia. Not stable. Only one i know of is the Drunk Elephant that came in recently, i have yet to check them out. Jetske Ultee is absolutely right. I am not too familiar with PC products, i don't want to comment on them. They have a high >20% C i have evaluated for a friend before, also using anydrous formulae. You know the downside to LAA in Anhydrous formulae? The stability comes at a price. The absorption is no where as good as LAA in water I wonder is other derivatives will be superior to Anhydrous Ascorbic acid. Greedy Preciousia bought 1 of every Vitamin C The Ordinary released. Packaging: hate it. I have elected to decant all the damn droper bottles to airless ones. In these formulations, either the VC is suspended as powder in silicone bases (so no water) or the powder is actually supplied separately. If suspended, the majority of the VC is trapped within the silicone that is applied on the surface and only a small % will come into contact with the skin. Of this %, a maximum of about 33% can dissolve within the water content of the skin to be used and so from a 20% VC formula, 5% maybe exposed to the skin and 33% of 5% which is less than 2% is actually potentially used. If the VC is supplied as a separate powder to be mixed, there are two issues: a) powder weighs far less than water by volume and cannot be measured in ml as supplied. To achieve a 10% formula, you would need to fill your palm with VC powder and add liquid which means most such products would last less than 1 few days; b) the oxidation begins at the time of mixing anyway; it's just less oxidation since the mixing occurs at a late stage. These ingredients include Magnesium/Sodium Ascorbyl Phosphate (MAP or SAP), Ascorbyl Palmitate, Ascorbyl Glucoside and others. These technologies are stable but release small amounts of Vitamin C so a 10% solution of MAP (which is high), may release 2-3% of pure Vitamin C at best. The problem common to all of the above, first and foremost, is that VC is very cheap and can be obtained even at retail (nutrition shops) for $30/KG to last a lifetime of topical application so I am not sure why many of these formulations are so expensive. What are your thoughts on Anhydrous formulae if only 2% is absorbed out of 20% (if true according to Brandon Truaxe)? I made a paypal account and bought The Ordinary products, however I really wanted the 20% Ascorbyl Tetraisopalmitate product, but it was not available. I hope importing the products to the Netherlands is not that expensive, because that's something I will only know by the time the products arrive at my house. I rather use a stable anhydrous ascorbic acid than an oxidized one. Oxidized ascorbic acid does cause free radical damage in skin, and every product in store with water and ascorbic acid is oxidized to some extend. In theory after about 2-3 days already a significant amount has oxidized, and you can't see any color change during that first stage. The advantage of some derivatives is they are oil soiluble and can be better absorbed by skin and won't oxidize as fast. But of course it has to be converted, the golden standard still is Ascorbic Acid. It's just like Retinol and Retinoic Acid. Some rumors are on the internet that the palmitate part could cause skin damage, where they refer to Retinyl Palmitate and Ascorbyl Palmitate (and also Ascorbyl Tetraisopalmitate), but I don't think it's true. Thus far studies have only shown these ingredients to have benefits, and no studies have concluded Palmitate to have negative effects on skin. According this study you still get the benefits of an anhydrous Ascorbic Acid product, and also without water ascorbic acid is less irritating to skin. But about the decanting. You should really take care about that process. Many brands use special dubbel layered plastics, which reduce air flowing in the product through the packaging itself. I don't know the name anymore, but Paula's Choice uses these plastics for their Super Antioxidant Serums. I don't know if the airless pumps where you decant it into use these kind of plastics. And also some people reuse there airless pumps, which might not be a problem for a body lotion, but for very instable ingredients it is, residues from tap water, the former product and reactive molecules will stick to the walls of the container (even after thorough cleansing and rinsing with alcohol) which destabilizes ingredients like Ascorbic Acid. And for some ingredients even during the production process destabilization may already occur, where decanting only worsens the situation even more. Personally I'm really unsure if I want to decant my cosmetics, if it's a dropper bottle maybe its better, because you can't make it any worse than that. But if it's a tube packaging, I think trying to avoid air flowing back in the tube (so during usage of the product keeping the product vaccuum) is in my opinion probably better. I just don't understand why they don't use airless pump packaging, it's easier to handle, it preserves the product better. I just think people like that very much. And for the liquid formulas, of course that's more difficult, but I bet there is airless packaging for that as well. What Ordinary products did you buy? lol i will be receiving the Ascorbyl Tetraisopalmitate product in approx a weeks' time. it was mailed out 8 days ago. I hope you won't have to pay too much taxes on your items. omg. it is 20% that's higher than what is recommended! >"I rather use a stable anhydrous ascorbic acid than an oxidized one. Oxidized ascorbic acid does cause free radical damage in skin, and every product in store with water and ascorbic acid is oxidized to some extend." > Retinyl Palmitate and Ascorbyl Palmitate (and also Ascorbyl Tetraisopalmitate), but I don't think it's true. Thus far studies have only shown these ingredients to have benefits, and no studies have concluded Palmitate to have negative effects on skin. so far only 1 study identified it. there were many more studies that refuted that it is detrimental when used in the sunlight. you want me to dig the studies out? i got them saved somewhere. i do ensure there is NO tap water... so far so good. similar to your advice. (thankyou) I do not decant tubes. only jars and dropper bottles as you introduce bacteria and air which each usage. 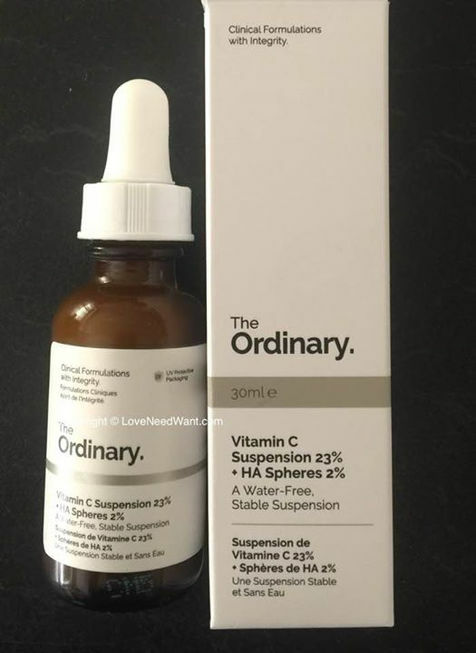 Lucky me i ordered The Ordinary Vitamin C and it came in a dropper bottle and it was very user unfriendly as the product is thick in viscosity and the dropper was useless to dispense the products. so much product end up outside the bottle. they have changed the packaging to tube now which will save me the hassle of decanting! Need to see what Deciem is using for their more expensive products. Sometimes when companies use jars and crap packaging, i question their choices perhaps in other areas of the products. I am likely to stay loyal to a company who uses airless packaging too. I'm really eager to try the Vitamin C suspension 23%, because its anhydrous and contains the gold standard Ascorbic Acid. Hopefully it's stable! I really hope I can order the Ascorbyl Tetraisopalmitate 20% in the future (it now says "Email me when in stock"), it is far less irritating (acidic), better absorbable and much more stable than Ascorbic Acid. Although it has to be converted to Ascorbic Acid to have its skin benefits. I really want to know what you think of the Ascorbyl Tetraisopalmitate 20% when you've tested it. Sadly I guess the Caffeine solution can't be stable with the EGCG. And the other downside of the products is they only use one (or two) active, while vitamin C really should be combined with other antioxidants. I also think it's pricing. But still tube packaging costs maybe 0.10 and a bottle 1.50. Its more expensive, but if a product costs 45 dollars, I don't think the extra 1.40 is a problem. But well maybe if airless pumps are becoming more popular producers will start using them. Even though L Ascorbic Acid is gold standard... i have a funny feeling it may not be as good in Anhydrous formula vs water soluble serum. It is stable! that's for sure... the downside is you compromise on the quantity your skin absorbs. Brandon says you get 2% out of 20%. yikes. i have also heard that MAP doesn't whiten /even skin tone as much as the other derivates but it is good for collagen... will test and see the best vitamin C for me. I'll be using other antioidant, so that's ok. I buy from Victoria Health. i preorder. so mine is already on its way to me. Any suggestions of methods to test the Vitamin C fairly? Packaging wise... definitely pricing. the airless can cost 10x more easily. I don't have access to wholesale pricing like them... the other issue is airless bottles sometimes (if poor quality) will give issues with pumps. I think they should just package everything in tubes. Cheap and good. i sure hope MORE manufacturers use the airless bottles! sick of decanting. What are you using the Caffeine Solution for? Not really sure what caffeine is good for other than depuffing eyes. Caffeine and EGCG may be effective in protection against sun damage (https://www.ncbi.nlm.nih.gov/pmc/articles/PMC2958188/). Although the best researched 'anti-aging' ingredients remain Retinoic Acid, Ascorbic Acid, Niacinamide, Alpha Hydroxy Acids and perhaps Soy Extracts (Genistein) and some polyphenolic compounds in Green Tea. Other actives are not that well researched. About the vitamin C serums. I only choose products that are in my opinion perfect ingredient wise, I don't even bother trying products with fragrances or irritant plant extracts. I would throw away the Avalon product, it's full of irritants, also it doesn't contain a high amount of vitamin C. How much does the Mad Hippie contain? The Melano Vitamin C Serum contains fragrances. I guess the Optilife contains less than 1% Ascorbic Acid, because Vitamin E is usually added at a maximum concentration of around 1%. So I would say, try The Ordinary products. 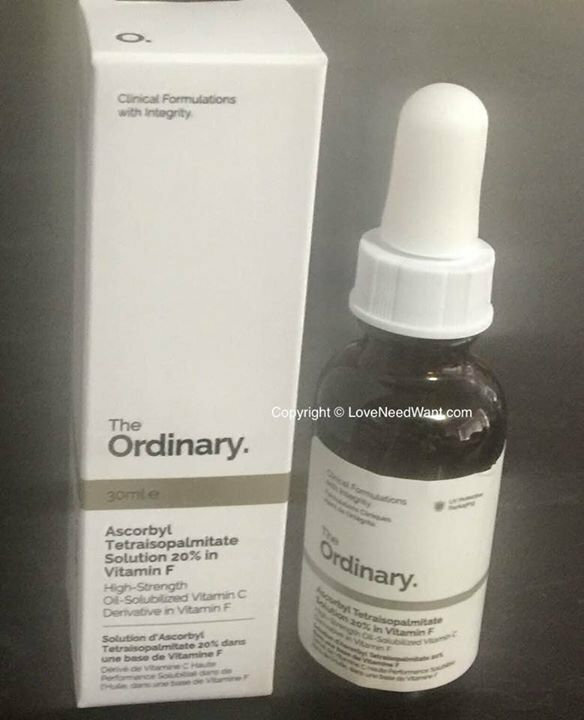 Ascorbyl Tetraisopalmitate is the best derivative, and also it's formulated in an oil base, so it's extremely stable and can be absorbed quite effectively. The Vitamin C suspension is very interesting because it contains anhydrous ascorbic acid. It think it then comes down to what you like texture wise, and to which product your skin responds best. Maybe you can do a split face experiment, so you can compare how you skin responds. That's what I do with many products. It appears there certainly are some ways to stabilize Ascorbic Acid in solution, look at page 215 and 216. Also sodium metabisulfite and other antioxidants stabilize ascorbic acid (https://www.ncbi.nlm.nih.gov/pubmed/16806754). if they do, they will label it and price it much much higher under their other brands perhaps Hylamide? 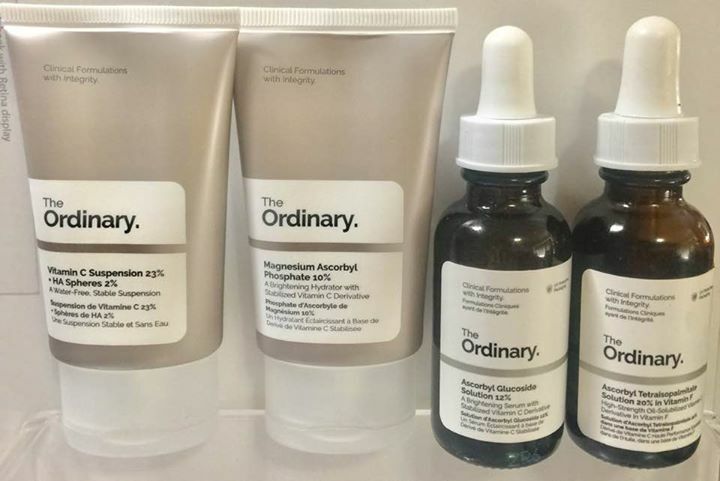 The Ordinary is their entry level brand to shake up the industry. There is a product with antioxidants like you say BUT it's not airless.... look into Skin Actives. They do contract manufacturing too. Avalon is due for the bin, you're right. Mad Hippie.. i finished 1 bottle today. going to decant 2nd bottle and use it up. I thought of what you said about that citrus ingredient and i didn't think it affected me.. but was scared nonetheless. Optilife was a sample.. and you're right. not much vitamin C there. misleading name they had. Melano seems good with good plant extracts... i don't have any issue with fragrance. and is oily ... used last, so at least not on bare skin. lots of raves in the community about this product. gotta check what the fuss is about. Other than ascorbic acid in water... i think Ascorbyl Tetraisopalmitate is the BEST or Tetra C i like to call it (same thing right)... however as it is mixed with coconut ingredients... i fear it may clog my pores. >The Vitamin C suspension is very interesting because it contains anhydrous ascorbic acid. It think it then comes down to what you like texture wise, and to which product your skin responds best. i like that there is no silicone to hamper with absorption but still.... it's not the texture that puts me off. it the lower absorption rare, suspended ascorbic acid vs ascorbic acid in water ... there's just no comparison. the latter trumps big time. They try to reinvent and get around the oxidative instability of Vitamin C and at the end of the day. the original L Ascorbic is still best! imho the antioxidants can help prolong the Vitamin C from going bad... but only a little more... or rather... not forever. just like Skinceutical's ferulic acid patent. Going to checkout your links! thanks for sharing. i'll share another.. someone said something controversial to me about oxidised vitamin C.. going to dig it up and share with you. in topical products; 10% and greater concentrations are common. topical delivery of vitamin C. J Invest Dermatol 121: 1118-1125.
profiles and differential scanning calorimetry study. Chem Pharm Bull (Tokyo) 46: 174-177. * Martin GR (1961) Studies on the tissue distribution of ascorbic acid. Ann N Y Acad Sci 92: 141-147. Health & Consumer Protection Directorate-General. i thought this from The Ordinary is very relevant and it addresses my fears about L Ascorbic Acid in water going "bad" / oxidises. Vitamin C has a very strong ability to bind to free radicals of oxygen, as soon as it’s dissolved in water, it starts to oxidize and change the colour of the solution (from clear to slight orange and later to dark orange). 2) far worse, the “antioxidant” formulation actually turns into a “pro-oxidant” formulation. The problem is that they may bind to oxygen in the bottle before you even buy any product claiming to contain antioxidants. Very simply, if a Vitamin C formula turns colour, the Vitamin C is oxidized and the formula becomes potentially damaging to the skin. someone shared these 2 reports with me, bear in mind the research is not independent. Conflict of interest statement : The author is the founding member of ReCverin LLC, a manufacturer and distributor of vitamin C products for consumers. They are promoting twice-oxidized vitamin C (dehydroascorbic acid! I'm gonna try that half face you recommended. That's why I like the Ascorbyl tetraisopalmitate, it's much much more stable. Also it's oil soluble, which is better absorbed by skin than water-soluble ingredients. Compare it to salicylic acid and glycolic acid, salicylic acid is oil soluble and is better absorbed by your skin. I think anhydrous ascorbic acid is better than ascorbic acid in water, because on skin some gets dissolved in the water present in your skin (which is indeed a lower percentage than in water dissolved ascorbic acid), but the not absorbed fraction in anhydrous serums won't oxidise on your skin during the day as fast. Because as you found oxidized vitamin c may become a prooxidant. Btw I've asked the ordinary. All products are stable in the packaging they use, also the caffeine+EGCG. They do stability testing. Also the retinol products are stable, at least that's what they claim. They made a comparison with prescription retinoic acid, which is also packaged in tubes and isn't that sensitive to air. Which might be a valid point, although I need to keep my retinoic acidic in the refrigerator where you can keep it for 4 months after opening. >I think anhydrous ascorbic acid is better than ascorbic acid in water, because on skin some gets dissolved in the water present in your skin (which is indeed a lower percentage than in water dissolved ascorbic acid), but the not absorbed fraction in anhydrous serums won't oxidise on your skin during the day as fast. Because as you found oxidized vitamin c may become a prooxidant. Bingo. Even fresh Ascorbic Acid can oxidise (not in the bottle) but on the skin! I have experienced this. Do you think this is dependant on the free radicals in the air? Any idea about the absorption time it takes for Vitamin C to be absorbed? I guess in terms of effectiveness. Ascorbic Acid in water is the best in results and fastest in absorption but the risk of oxidation can outweigh the benefits. That;s why perhaps my dermatologist did not sell Vitamin C with Ascorbic Acid. The product was still very good, and it did not irritate the skin. Not a low pH. I have yet to try Ascorbyl tetraisopalmitate in high concentration, so i will compare that with my 3 weeks experience with Ascorbic Acid in anhydrous formula and also the other derivatives i have tried as well as LAA in water. I never thought of keeping my tretinoin in the refrigerator. i will now ... great tip! And yes, i always finish it and throw it out... it will oxidise if kept too long. i have a tube that went bad. It became pro-oxidant, detrimental to the skin! @Peter This article you shared i enjoyed reading very much. What ingredients should i look out for that have "soy" ... it is also a very good Melanosome Transfer Inhibitor. > the best researched 'anti-aging' ingredients remain Retinoic Acid, Ascorbic Acid, Niacinamide, Alpha Hydroxy Acids and perhaps Soy Extracts (Genistein) and some polyphenolic compounds in Green Tea. Other actives are not that well researched. N-Acetyl Glucosamine is another ingredient that is complementary to Niacinamide and there has been countless studies to back it's effectiveness. Lovely lovely ingredients. and most of the time, not required in large quantities... if there is no issue with stability. i do not see why can't they all be combined. Wow what a powerhouse botanical plant based anti-oxidant this would be! Most companies would usually include 1 active ingredient, no more than 3... it's rare they'll concoct such a powerful product. The closest i have seen is made by Skin Actives. Many of the plant derived ingredients you're keen on are not the easiest to dissolve. Alcohol is usually best to dissolve the plant based ingredients but not well liked. On my retinoic acid cream it says store refrigerated. But I had another brand before that didn't need to be kept in the refrigerator. As far as I know not all the ascorbic acid you apply will be absorbed. From what I've read ascorbic acid is the gold standard, most beneficial effects linked to vitamin c comes from studies with ascorbic acid. But a derivative like Ascorbyl tetraisopalmitate is maybe in real life situations better because it's more stable, and possibly better absorbed because it's oil soluble. There are many studies on the other 'anti-aging' ingredients indeed. But some believe they can't be absorbed by skin that easily. Perry made an article here about it a while ago, based on a study where they answer the kligman questions for cosmeceuticals and the amount of good quality research. Then only the few actives I mentioned can be considered proven actives, but maybe some others can be as well. @Peter It'll make sense to refrigerate since it gets as hot >40°C here in Sydney during summer. I have started storing all my serums and creams in the refrigerator now. Good article on anti-aging ingredients! Ascorbic acid is the gold standard but what they are referring to is the one dissolved in water, there is still not much research on anhydrous LAA formula. you'll be keen on Table 2: Plants anti photo-ageing action. Water soluble ingredients are much more difficult to penetrate your skin. So most studies have indeed been done with ascorbic acid dissolved in water, simply because ascorbic acid is water soluble. But it doesn't mean it penetrates easily. Yes that was the post from Randy about anti-aging ingredients. Interesting articles. Indeed there are dozens of good plant extracts according to some studies, although there are only a few ingredients where their beneficial effects on skin has been proven by multiple good quality studies with real humans. Most of the plant extracts benefits have only been studied in lab studies or in a single study, with much uncertainty if those ingredients can really penetrate skin and can be used in skincare. But maybe after some years there will be more studies and we consider them good 'cosmeceutical' ingredients. @Peter hmmm i have read that fat soluble ingredients penetrate better. Will look at episode 92, thanks for referencing it! I am still working thru' all of TBB's chest of info. Plenty to go thru. The theory of how plants are out in the sun with polyphenols and flavonoids to deal with UV makes lots of sense. With medical studies, my understanding is sometimes the funding? Under what circumstances are medical research done? I do not have any science degree nor any idea on that. It does make sense that newer ingredients have less medical research done, or sometimes done by the company who are selling the patented ingredient. Independent IN VIVO studies are rare. in the table of anti-aging ingredients, there are several anti-aging ingredients that are excellent to treat pigmentation too. This table of skin lighteners are of interest to me for my pigmentation concerns. It's not clear which part of the plant that is the most effective. Sometimes, i see a company may include several similar ingredients from 1 botanical extract eg licorice. I wonder why they do that. I've seen an interview with Dr Sivak of Skin actives, she mentioned how some plant extracts are useless. It depends on the extraction process as the active ingredient may be present in a small % of the actual plant. Majority of the plant is celullulose, chorophyll, rubisco ( Ribulose bisphosphate carboxylase). Another journal on Skin anti-aging strategies you may have seen. this takes a broader picture and discusses invasive procedures, apart from topicals as well as lifestyle/habits. Some of The Ordinary products contain Propanediol, which is similar to Propylene Glycol, which can be irritating and allergenic to skin. Also the Lactic Acid products contain the allergenic fragrance Ethyl 2,2-Dimethylhydrocinnamal (aka cinnamal). And the BHT, Behentrimonium Chloride (quat which I'm allergic to) and Triethanolamine are not so great. So not all ingredients are perfect unfortunately. Also I really would like to know if its good to apply sugar (contained in the "Buffet": fructose, glucose, maltose etc) to your skin, because eating sugar will cause crosslinking of collagen (glycation). @Peter ;Propanediol can also be Propylene Glycol. Usually when i see propylene glycol i lose interest in the product. ...sigh.. with commercial products... perfection is not attainable. kindda like beauty. I do not like the VItamin C 23%. Depending on layers i apply, the ascorbic acid can pill off! "Also I really would like to know if its good to apply sugar (contained in the "Buffet": fructose, glucose, maltose etc) to your skin, because eating sugar will cause crosslinking of collagen (glycation). " Aqua (Water), Glycerin, Lactococcus Ferment Lysate, Acetyl Hexapeptide-8, Pentapeptide-18, Palmitoyl Tripeptide-1, Palmitoyl Tripeptide-7, Palmitoyl Tripeptide-38, Dipeptide Diaminobutyroyl Benzylamide Diacetate, Acetylarginyltryptophyl Diphenylglycine, Sodium Hyaluronate Crosspolymer, Sodium Hyaluronate, Allantoin, Glycine, Alanine, Serine, Valine, Isoleucine, Proline, Threonine, Histidine, Phenylalanine, Arginine, Aspartic Acid, Trehalose, Fructose, Glucose, Maltose, Urea, Sodium PCA, PCA, Sodium Lactate, Citric Acid, Hydroxypropyl Cyclodextrin, Sodium Chloride, Sodium Hydroxide, Butylene Glycol, Pentylene Glycol, Acacia Senegal Gum, Xanthan Gum, Carbomer, Polysorbate 20, PPG-26-Buteth-26, PEG-40 Hydrogenated Castor Oil, Trisodium Ethylenediamine Disuccinate, Ethoxydiglycol, Sodium Benzoate, Caprylyl Glycol, Ethylhexylglycerin, Phenoxyethanol, Chlorphenesin. I am liking this product so far. Breakdown of the actives. Contains two matrikines, Pal-GHK and Pal-GQPR. Acting as messengers of cutaneousrestructuration and repair, these two peptides work synergistically to restore and maintain the skin's youthful appearance. Matrixyl® 3000 has been shown to regulate the expression of well-known (SA β-galactosidase) and recently discovered (progerin) markers of senescence. Indeed, it does not only reduce the SA β-galactosidase activity, but it also reduces the progerin's expression while preserving the expression of the normal form lamin A*. Then, immunohistochemistry analysis of skin sections ex vivo has proved that Matrixyl® 3000significantly stimulates synthesis of Collagen-I, -IV, -VII, -XVII and Nidogen-I proteins. While these proteins of the dermis and dermal-epidermal junction usually decrease with age, Matrixyl® 3000 rejuvenates the dermal structure. A peptide produced from derivatives of the amino acids lysine and methione sulfone (the latter is synthetic). Palmitoyl tripeptide-38 is a matrikine-mimetic compound that regulates cell activity, wound repair and collagen tissue remodeling. formulated to get rid of wrinkles, crow’s feet, and other signs of aging. designed to fight aging, is a synthetic form of snake venom. Syn-ake replicates the effects of a peptide that is known as Waglerin 1, which is a component of the venom found in the Temple Viper. created for skin elasticity and tightness enhancement in cosmetic formulations. the peptide in Relistase was found to best inhibit excess elastase activity, helping to improve skin elasticity lost due to the normal process of aging or by extransic factors such as excessive solar exposure or air pollution among others. By reducing excess elastase activity, RelistaseTM helps to protect elastin and other ECM components which are susceptible to degradation by these enzymes resulting in loose, sagging and wrinkled skin. The tetrapeptide also exhibits collagen boosting properties favoring connective tissue improvement, enhancing tensile strength and elastic resistance, thus leading to firmer, tighter, elastic and younger skin. helps fight inflammation in the gut, neutralizing some toxins and helping to block out others. decrease skin sensitivity by reducing neurone reactivity and neurone accessibility. act as water-binding agents, and some have antioxidant properties. Amino acids can be combined with other ingredients that have skin-restorative ability to work in unison to fight signs of aging. I know propanediol exists in two forms, most probably they use 1,3-propanediol. This isn't exactly the same as propylene glycol. The molecular structure is different, but still the effect on skin is almost identical. So if I can choose between multiple products (the 4 vitamin C products for example), I'm going to choose the one without propanediol. The caffeine serum also contains propanediol, but I think I simply have to live with that. I've heard it is very popular to add ingredients like Fructose, Glucose and Maltose in cosmetic products in France. It will give hydration. But I haven't found a study proving it's good for skin. On the other hand the Buffet contains such a crazy amount of very good ingredients (peptides, amino acids, hyaluronic acid, allantoin, sodium pca) you can't simply ignore this product. Thus far I'm in love with the Buffet, the 10% Niacinamide and the caffeine serum. The 23% Ascorbic Acid is also good and extremely potent, but it doesn't absorb as fast, and they say you can't combine it with the Niacinamide. I've ordered the other products as well, so I really hope I like the 20% Ascorbyl Tetraisopalmitate. According to them it's no problem to combine the derivatives with other products, and the ascorbyl tetraisopalmitate is also preservative free. @Peter If i am not allergic to propylene glycol, is it an issue? Is the ingredient bad? i don't remember why i dislike it so much. I'm don't think you have to live with anything! I was on Skinactives website today and i am tempted to buy their Black friday sales of the coral serum, some actives and DIY what i want and exclude the ingredients we don't want. >On the other hand the Buffet contains such a crazy amount of very good ingredients (peptides, amino acids, hyaluronic acid, allantoin, sodium pca) you can't simply ignore this product. yup. saves me making my own. lol .. sometimes DIY is expensive.. more expensive than buying ready made. if something is readily available and too much more expensive or overpriced (cost vs selling price)... i will just buy off the shelves. i think i found a study that Ascorbic Acid in anhydrous takes hours... did i share here before? MANY HOURS!!! so it could even be rubbed off in our sleep before the skin has a chance to absorb it. >ascorbyl tetraisopalmitate is also preservative free. i did a brief comparison review of the 4 Ordinary Vitamin C i have. review here. I have reviewed only 2 so far. queueing to try the rest.. maybe in 2 weeks... my Ordinary LAA is running low. Will update the page once i try the rest. i had a tip off from someone which i have yet to verify that this Australian company makes a 25% Ascorbyl Tetraisopalmitate! this is the product. the ingredients are better than The Ordinary and it isn't expensive. I have used the brand's products prior and they are good. I like this brand. ingredients: Ascorbyl Tetraisopalmitate. ("Super" Vitamin C), Natural Vitamin E, Olive Squalane. they have shared before and after photos and i have seen online reviews... quite effective! 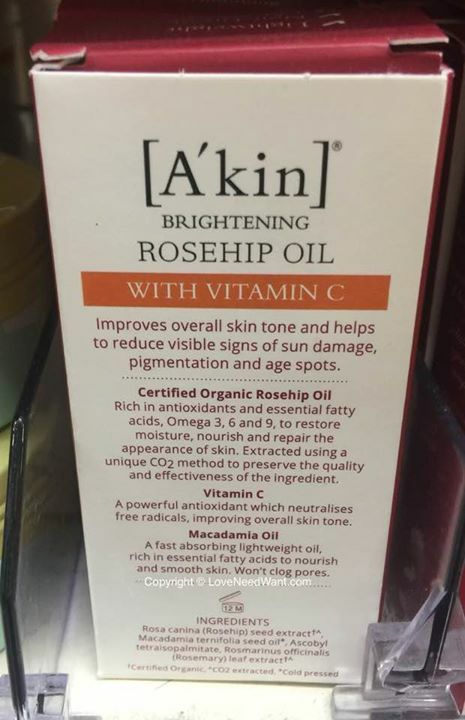 Another brand too of interest is A'kin Rosehip oil + Ascorbyl Tetraisopalmitate. i don't know the concentration of this.. but i recommended my friend recently and she opened to let me try... it's really nice quality. i have emptied a bottle of A'kin rosehip oil before (they didn't have this version before) and they are one of the best rosehip oil in the market in Australia using supercritical extraction process (without oxygen). I will email the company and hope they reply to advise the concentration % of Ascorbyl Tetraisopalmitate. Allergy can be one of the problems with propylene glycol, but the main problem is its irritation potential which can occur at concentrations as low as 1-2% (link). In that regard, I totally disagree with Paula Begoun (she rates it as good). Pentylene Glycol, Hexylene Glycol may be somewhat irritating as well, but not as much as propylene glycol. This book explains a bit more in detail what damage phototoxic plant extracts do inside your cells, link, p634. You still don't believe me that the Buffet (or matrixyl) doesn't contain copper ;-) A peptide isn't automatically a copper peptide, the Buffet of The Ordinary contains peptides bound to palmitic acid (in stead of copper). Deciem does have copper peptide serums, but there's no problem with combining The Ordinary Buffet with the Ascorbic Acid because it doesn't contain copper. It is true in general that vitamin C doesn't absorb very well, that's why you need to use such extreme high amounts for it to be effective. But 23% anhydrous vitamin C will definitively give you the anti-aging benefits of Vitamin C. And also consistent use will give you kind of a reservoir of Vitamin C in skin. I just received all the other Vitamin C serums of The Ordinary. The 23% Ascorbic Acid is really something for PM use, I think its very good, but I like to use multiple products so then a derivative might be better. The Moogoo Super Vitamin C serum looks good, squalane is also a photoprotective ingredient. Although its more expensive than The Ordinary 20% Ascorbyl Tetraisopalmitate. And I'm wondering about the 25% Tocopherol, if that's true, it really is too high, Tocopherol is fine anywhere between 1-2%, but any higher can be detrimental to skin. I guess the A'kin contains a rather low percentage of Ascorbyl Tetraisopalmitate, also it contains the irritant Rosemary Leaf Extract.